With festival season on the horizon, music enthusiasts everywhere are gearing up to spend the weekend seeing their favorite bands live (and dancing the night away). Make no mistake, your Instagram feed is about to be flooded with babes decked out in 70s-inspired getups in big fields full of people, food, and fun. Now, when it comes to nail looks, decking out your digits in fun, festival-inspired nail art designs can be just as much a conversation starter as any other aspect of your look — and you know style is key for festival season. So, whether you're more into keeping things a bit more feminine and delicate with some 60s-style florals or you're ready to go all out with neon colors, peace signs, and smiley faces, trust us: There's a Coachella-ready design out there for you (heck, it might even help ease your FOMO if you're sitting this festival season out). 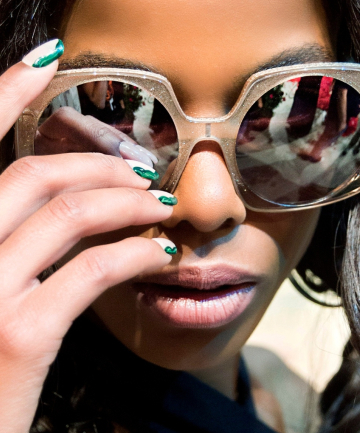 We've gathered some of our favorite nail art ideas slideshow ahead.